Asiana Airlines has unveiled a new medium-term business plan which envisions capacity and fleet growth of 25% over the next four years as the South Korean carrier aims to break into the top 10 global airline rankings. Asiana plans to focus over the medium term on expanding its relatively small long-haul network as opportunities for short-haul expansion become more limited due to bilateral constraints and increasing competition from LCCs. Asiana’s medium-term fleet plan includes 17 additional aircraft, taking the fleet from 71 aircraft currently to 83 aircraft by the end of 2013 and 88 by the end of 2015. Narrowbody passenger, widebody passenger and freighter aircraft will all be added over the next four years. But the biggest capacity growth will be seen in the widebody passenger segment, which will grow from 32 to 40 aircraft. The additional widebodies, including six A380s, are designed to give Asiana an opportunity to build up its long-haul network and close the gap with its Asian peers, which have much bigger operations in North America and Europe. Compared to 2010 levels, Asiana’s passenger capacity will grow by 5% in 2011, by 14% in 2013 and by 25% in 2015. Asiana’s medium-term plan and strategy was outlined by senior VP strategic planning E Bae Kim during a 04-Nov-2011 media briefing at the Association of Asia Pacific Airlines (AAPA) Assembly of Presidents in Seoul. Asiana’s long-haul network currently only consists of six destinations in North America and four in Europe. In comparison, archrival Korean Air (KAL) serves 12 destinations in North America and 13 in Europe. 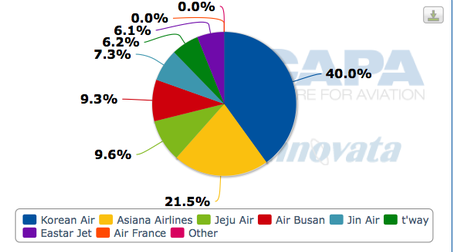 Asiana currently only has a 20% share of the Korea-Western Europe and a 22% share of the Korea-US market, compared to 45% and 64% shares for KAL, respectively, according to CAPA’s Route Analyser Tool (see Background information below). This year Asiana has focussed on increasing the frequency of its long-haul routes to provide a better product, particularly to the business sector. Services to London, San Francisco and Seattle have all been increased to daily. Honolulu and Istanbul were also recently launched, giving Asiana six destinations in the US (Chicago, Honolulu, Los Angeles, New York JFK, San Francisco and Seattle) and four in Europe (Frankfurt, Istanbul, London and Paris). Mr Kim says Asiana’s first A380 will be delivered in 2013 and all six aircraft on order will be delivered by the end of 2014. The A380s will be used to increase capacity on existing long-haul routes, freeing up B777-200ERs to launch new routes to Europe and North America. Asiana has expanded rapidly since being established as Korea’s second network carrier in 1988. But until now the Star Alliance carrier has primarily focussed on short- and medium-haul expansion within Asia. Mr Kim says over the last several years Asiana has been unable to pursue significant expansion of its long-haul network due to a shortage of widebody aircraft. The decision was, therefore, made last year to start focussing on long-haul expansion with the A380 selected as the ideal tool to accelerate long-haul growth. The new strategy is designed to give Asiana’s short-haul operation a larger mix of passengers that connect onto long-haul flights. Relying more on this type of passenger is key as Asiana will face increased competition in the short-haul point-to-point markets as LCC penetration rates in North Asia, which until now have been very low, start to increase. “Based on our strong short distance network we will be able to expand our long-distance network and will be able to respond effectively to LCCs by focusing on the long-haul network,” Mr Kim explains. In addition to the six A380s, long-haul network expansion is also made possible by the 30 A350s Asiana has on order. But the first A350 is not slated for delivery until 2015. Asiana is yet to finalise its fleet plan for 2015 and beyond. Mr Kim says the total size of Asiana’s fleet for 2015 and beyond will be determined two to three years in advance, factoring in demand at the time. The A350s will likely be used for a combination of growth and replacement of Asiana’s medium-size widebody fleet, which currently includes A330s and B767s. Asiana has some flexibility with its widebody fleet, particularly with its relatively young A330s which can be retained if a faster growth path is elected. While Asiana has a rather limited long-haul network, rapid expansion of its Asian operation, particularly in China and Japan, has allowed it to steadily increase its share of Korea’s total international market. Mr Kim says Asiana was able to capture 26% of Korea’s international market in 2010, compared to only 23% in 2007. Based on capacity data for the current week, Asiana has a 23% share of Korea’s international market while KAL has a 38% share. Asiana now operates 608 weekly flights across 85 routes to 69 cities in 22 countries. It also offers 243 routes and over 2100 flights to 19 countries via codeshare partners with 24 airlines. The carrier particularly relies heavily on the Chinese and Japanese markets. 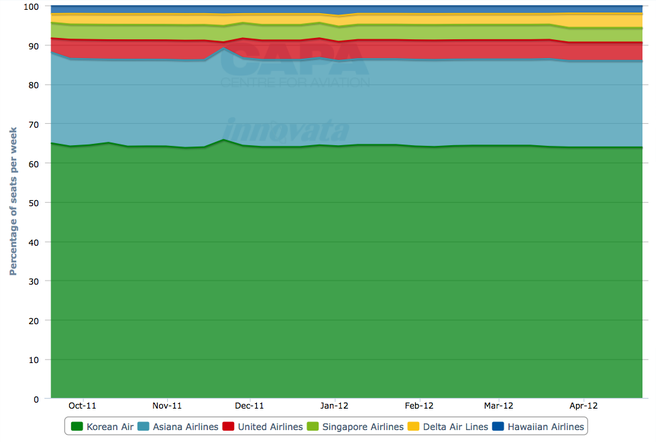 Japanese routes now account for 19% of Asiana’s passenger revenues and Chinese routes account for about another 20%. China and Japan account for over half of Asiana’s destinations. Mr Kim says traffic on Korea-Japan routes “has recovered to normal levels” following the Mar-2011 earthquake and tsunami in Japan. He says outbound Korean leisure traffic remains very soft but this has been offset by a large influx of inbound traffic from the Japanese leisure sector. As a result, Korea-Japan traffic is expected to record 5% growth this year despite the crisis from earlier this year. Asiana serves 17 destinations in Japan. In addition to benefiting from the rapid growth in the Japan-Korea and China-Korea local markets, Asiana and KAL both carry a large portion of Japanese and Chinese passengers beyond Korea. Korea’s network carriers are particularly strong in secondary cities in Japan and northeast China, where there are limited international services. Incheon Airport offers a more convenient transit point for these passengers than the more congested airports in Beijing and Tokyo. 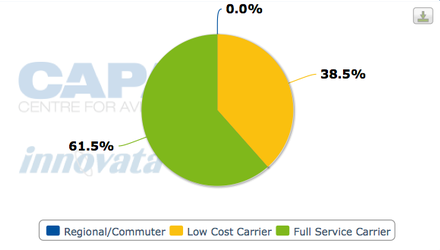 Between 40% and 50% of Asiana’s passengers now transit at Incheon. Asiana expects this figure to remain steady as the carrier expands, although the mix of short-haul to long-haul connections compared to short-haul to short-haul connections will likely increase. While Asiana will direct a large portion of its additional capacity over the next few years to long-haul flights, it will also continue to expand in Asia when there are opportunities. This year, for example, Asiana significantly expanded its Vietnam operation as opportunities in the Vietnam-Korea bilateral opened up. “Whenever opportunity arises in Asia we will consider those but we don’t have specific locations in mind for expansion at this time,” Mr Kim says. China is a huge market for Asiana, with 20 destinations, but further expansion is partially contingent on an expanded bilateral. Mr Kim says Asiana is particularly keen to open up more routes to China as the Korea-China market does not yet face LCC competition. 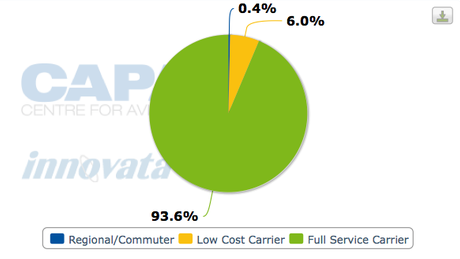 LCCs currently only account for 17% of total capacity (seats) in Korea, according to Innovata data. There are five local LCCs in Korea but they are all small. Three of the LCCs are independent – Jeju Air, t’way and Easter Jet. Air Busan is partially owned by Asiana and Jin Air is fully owned by KAL. While Korean LCCs have made inroads into the domestic market, particularly on routes connecting mainland Korea with Jeju Island, so far there is very little LCC presence on international routes to and from Korea. LCCs now account for only 6% of total international capacity in Korea while the LCC penetration rate is 39% domestically. Korean carriers also face the prospect of competition from new Japanese LCCs. For example, Japanese LCC start-ups Peach, ANA Japan and Jetstar Japan will likely serve Korea after launching services in the domestic Japanese market next year. Mr Kim says it is too early to know what kind of impact the Japanese start-ups will have on Asiana and decide if any kind of competitive response is needed. However, Mr Kim says Air Busan may add capacity to Japan next year using the two additional aircraft it will receive. Mr Kim says the small carrier is committed to expanding its fleet in 2012 from seven to nine aircraft. But if Japan is selected as the market to receive the additional Air Busan capacity, the flights will be operated out of Busan in southern Korea rather than Incheon. The new Japanese LCCs are likely to ultimately serve both Busan and Seoul. Asiana is cognisant that more LCC competition is inevitable. Clearly faster expansion at Air Busan is an option Asiana can turn to should it feel threatened. But for now Asiana is confident it can fend off increased LCC competition at Incheon without using a second LCC brand at its main hub. Mr Kim points out that Asiana and KAL have a competitive cost structure on regional routes because of their high economies of scale. Jin Air also has so far only pursued modest expansion as competition with LCCs has remained limited in Korea. KAL, however, has more flexibility to respond to LCC competition if needed because it owns 100% of Jin Air while Asiana only owns 46% of Air Busan. Jin Air also already serves Incheon while Air Busan currently doesn’t serve Korea’s main airport. “The basic strategy is not to use Air Busan for the Incehon market,” Mr Kim says. Mr Kim says Asiana has instead used its strategic investment in Air Busan to build Asiana’s market share at Korea’s second largest city, Busan. As a result, Mr Kim says Air Busan has followed a community or local airline model rather than a pure LCC model. KAL has traditionally dominated the Busan market. But Asiana and Air Busan combined now have a 35% share of the market compared to 43% for KAL, according to capacity data form Innovata. According to schedules in the Innovata database, Air Busan now operates two domestic and six international routes from its Busan base, including three in Japan and one each in Taiwan, the Philippines and Hong Kong. 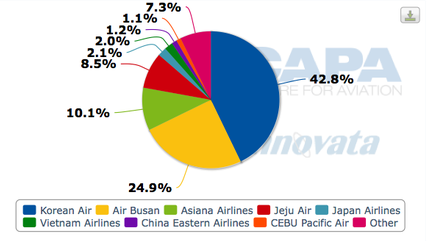 According to Innovata data, Asiana currently has a 22% share of Korea’s small domestic market while Air Busan has a 9% share. 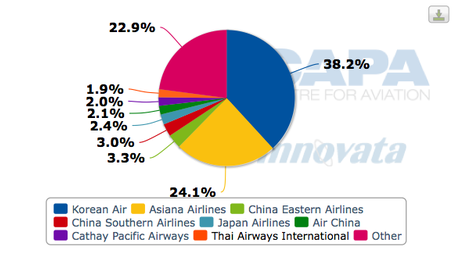 Market leader Korean Air has a 40% share domestically while its Jin Air subsidiary has another 7%. Domestic traffic in Korea has dropped significantly since 2004, when the country’s first high-speed rail (HSR) line opened. HSR has left Jeju Island as the only major domestic market. 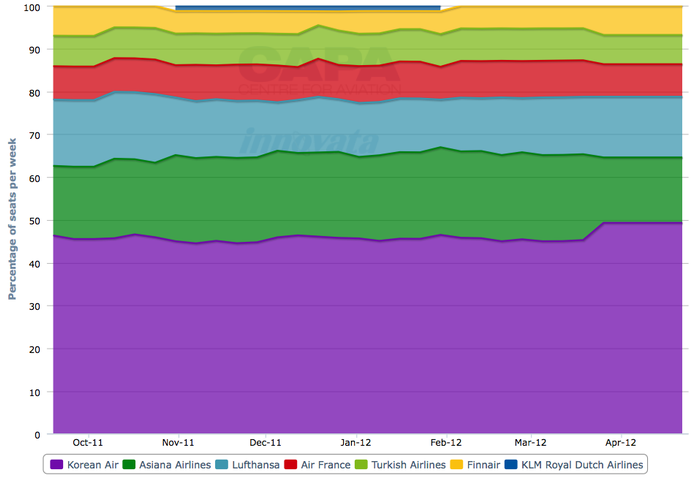 Domestic routes now only account for about 8% of passenger revenues at Asiana. Cargo is a far more important part of Asiana’s business, accounting for almost 30% of total revenues. Asiana’s medium-term business plan also projects further cargo growth despite the current softness in the cargo market. While cargo traffic has dropped so far this year, Mr Kim says over the last two months “the recovery is a little more evident”. Due to the current uncertainty facing the cargo market, Asiana is now only predicting modest cargo traffic growth for the next few years. But Mr Kim says this “conservative outlook for the cargo area” could be upgraded, resulting in more rapid growth, should the global economy recover fast. “That is one silver lining,” he said. Mr Kim points out that it is easier to respond to fluctuating demand in the cargo business compared to the passenger business. For example, it is much easier to launch new cargo routes as very little lead time is needed for freighters. Asiana currently has not decided on any new cargo routes for 2012 but it will look to make quick adjustments like it did this year, when it quickly launched freighter services to Miami and Portland in Oregon. Similar to the passenger side of the business, Asiana plans to focus cargo capacity growth on the long-haul network. Mr Kim says Asiana’s cargo business is “quite vulnerable to fluctuations in demand from China and Japan so we need to expand our routes”. As Asiana eyes significant expansion of its long-haul passenger and cargo network, the carrier is embarking on a new phase in its 23-year history. After rapid growth in its first 10 years, which Mr Kim says was pursued to achieve an economy of scale at an early stage, Asiana contracted following the onset of the Asian economic crisis in 1998. “That’s how we were able to survive,” Mr Kim recall, adding that growth was quickly resumed after the crisis ended. Over the last four years Asiana has faced challenging economic conditions due to the global economic crisis. But it also has used the recent period to better prepare for the future with its strategic investment in Air Busan and signing contracts for new A350s and A380s. In addition, Asiana has invested in cabin retrofits, including new in-flight entertainment systems and lie-flat business class seat for its widebody fleet. To facilitate growth, Mr Kim points out that Asiana is now investing in the construction of a second maintenance hangar at Incheon. New reservation systems are also being acquired to facilitate growth over the medium-term plan. Mr Kim says Asiana has “a shortage of hangar facilities currently” and therefore has to outsource some heavy maintenance of its fleet. The new hangar, which will be able to accommodate Asiana’s current fleet as well as the future A350s, will allow the carrier to in-source all or nearly all of its airframe maintenance. While Asiana has seen its profitability slip this year due to increasing oil prices and the challenging global market conditions, a record high profit in 2010 puts Asiana in relatively good shape. “In terms of financial stability we believe we have acquired that and for next stage we do have foundation for growth,” says Mr Kim. He explains this “financial stability” prompted Asiana to decide to make several long-term investments, including the A380 purchase. While only six aircraft, the A380 order represents a major milestone for Asiana as it provides a significant expansion of capacity on long-haul routes, particularly to the US. It also allows Asiana to provide a higher level of service, potentially matching rival KAL, which began operating A380s earlier this year and opted for the lowest density configuration among all A380 operators. But the next few years will also have challenges for Asiana. KAL told CAPA at last week’s AAPA Assembly it also plans to focus on long-haul expansion over the next couple of years as there are limited opportunities to further grow its short-haul operation, due in part to bilateral limitations with China. KAL is expected to significantly expand in the US as well as Latin America, where it already serves Sao Paulo and is now looking at several potential new destinations including Lima in Peru. Asiana has no plans to serve Latin America but is expected to look at launching services to Canada, where KAL already serves Toronto and Vancouver. It is unclear if all the additional capacity planned by Korean carriers to North America and Europe can be sustained, particularly given the current weakness of the economies in these mature markets. Asiana is banking its investment in new widebody aircraft will allow it to carve out significantly larger shares of the Korea-US and Korea-Western Europe markets; and using its efficient and geographically well-positioned Incheon hub also ends up with larger shares of the greater Asia-North America and Asia-Western Europe markets. But such a strategy has big risks and may prove to be unprofitable.